What's Involved in this Math Problem? BlogHome » Blog » What’s Involved in this Math Problem? What’s Involved in this Math Problem? Kristen has four flowers. She gives some to a friend. Now Kristen has two flowers. How many did Kristen give her friend? Draw pictures to help you solve the problem. 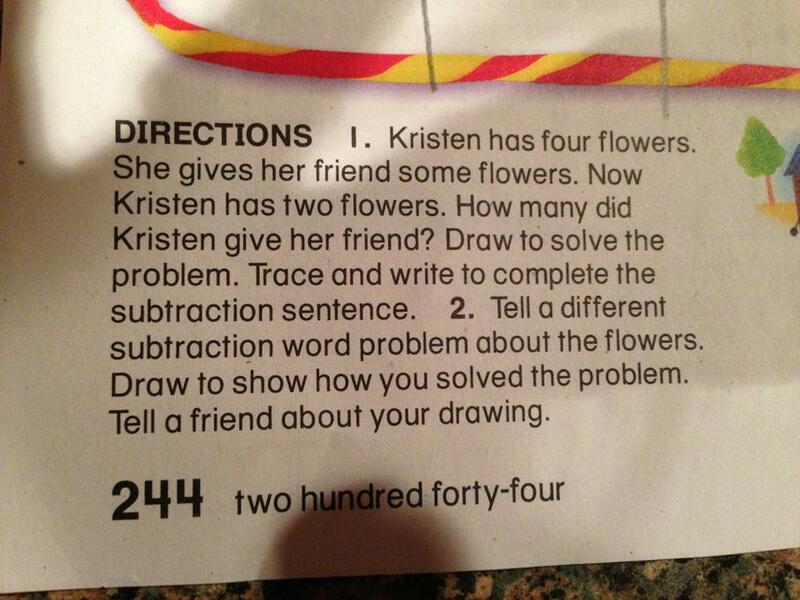 It’s listed as a kindergarten homework problem. If you teach math, you know this problem includes some of the biggest arithmetic concepts there are and you’re not deceived by the use of small numbers. And, they need to understand cardinality, that the name of a number relates to a specific quantity–including the huge idea that “two” isn’t the second object, but a set of two objects. This is a major leap in knowledge, often hindered by memorizing names of numbers. Too often, students learn to count to 30 or 100 but don’t understand the concepts involved. If you teach math, you wouldn’t want most kindergartners working on problems quite like the above, even if the designers of the Common Core State Standards (CCSS) somehow decided that they should master all of this at age 5 if they are to be “college and career ready” at age 18. You’d know that you can’t rush on unless they have these big concepts in their toolkit. You’d want to follow the lead of successful countries like Singapore, where kindergartners talk about objects and quantities in pictures and stories, learning to describe the world in numbers, rather than rushing to abstractions of word problems. Last year I worked with a school where a majority of students weren’t at grade level in math. The teachers had been using intervention time to drill for tests. I suggested using the time for mastery of these big concepts. “You have to camp on them until students grasp them or these holes in their foundational understanding will block future progress,” I pleaded. One of the special education teachers took my advice. She told the rest of the staff, “I stuck with the concept of combinations of five with one of my third graders for what seemed like weeks. And finally, he really understood. That day he was sitting with fifth graders. “What are they doing?” he asked. She gave him a copy of their assignment. And that third grader, newly confident that he could understand math, figured it out. We can’t rush students through concepts. We already have a nation of math-anxious people and rushing will simply create more. Let’s slow down and seek mastery of the building blocks of math. What Does “Whole Child” Mean to You? previous post: Were You Ever a Child??? next post: Must We Be For Or Against?